SOUTH EAST VIEW OF ST. PAUL'S CATHEDRAL. A hand coloured aquatint engraved by Daniel Havell after the painting by J. Gendall and published in London by Rudolph Ackermann in 1818. 15½ x 19¾ inches, framed. Since it's completion in 1715 St. Paul's Cathedral has remained as a symbol of the city's rebirth after the Great Fire of 1666. This magnificent building was designed by the celebrated architect Sir Christopher Wren and although construction work began in 1675 the project was not completed until forty years later and after costs amounting, in eighteenth century terms, to £1,500,000! This perspective shows the cathedral in all its grandeur in the early nineteenth century soon after the centenary of its completion with a foreground enlivened by carriages, wagons and street vendors. John Gendall of Exeter (1789-1865) started working for Ackermann in 1811 as a draughtsman and illustrator, later becoming a manager of the firm. 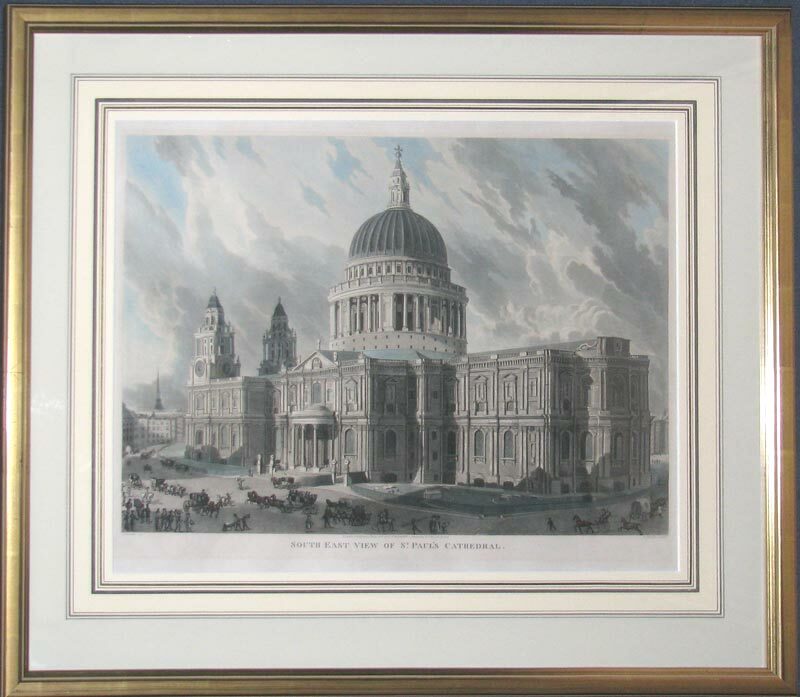 Between 1817 and 1819 Gendall worked on a series of views of London, published as large format aquatints. He also worked on the development of the new new art of lithography. After leaving Ackermann's he returned to Exeter: in 1861, he was listed, along with his wife Maria, in business as a landscape painter, carver and gilder employing seven men and four boys. He regularly exhibited his works at the Royal Academy until 1863, his career curtailed by a railway accident in 1864 that left him with a partially paralysed right hand. Daniel Havell was born in 1785 and spent his working life in London where he engraved, mostly in aquatint, after his contemporaries. This view of St. Paul's is, arguably, his most accomplished work. He is thought to be the nephew of Robert Havell, the prominent engraver of the late eighteenth and early nineteenth century, and the two often collaborated in the production of particular plates.